Disco Double is a 5 reels and 20 paylines slot game powered by iSoftBet. The main attraction of this slot game is the bonus round! Watch out for the mirror ball which doubles all payouts when it forms part of a winning combination! Disco Double slots is a glamourous slot game as long as the theme is concerned. Symbols that come into play are as glitzy as the game. You’ll find icons like, single bars, double bars and triple bars which offer up to 100 coins on an active payline. Green and blue 7’s award 200 coins, the red 7 awards 400 coins and the gold 7 awards up to 600 coins. The top paying symbol is the purple star, which awards up to 800 coins per payline. 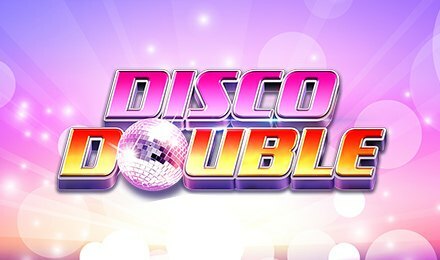 Enjoy Disco Double slots after you place your bets and watch as your wins are revealed! Coin Values: Set your bets from £0.20 to the maximum of £20.00. The wild replaces for all symbols bar the scatter symbol. Landing three, four or five wilds will award 700, 5,000 or 10,000 coins. Land three, four or five scatter symbols anywhere on the reels and trigger the Free Spins Feature. As well as 1x, 10x or 125x your total stake. This feature will award you 10 free spins. Keep your eyes open for the mirror ball which will double out all your payouts if it lands on the middle reel. Enjoy the disco at Moon Games Casino today and win big with rewarding symbols and bonus rounds!